A VILE thug spat in the face of disabled woman after she asked him to stop shouting outside her flat in the early hours of the morning. Jason Smith, 21, had been ringing the buzzer and shouting up at a first-floor flat in Fareham to a pal asking for his insulin injections. But when the alarmed disabled resident living downstairs asked him to be quiet at 1.15am he turned around, hurled abuse and spat in her face. ‘The defendant walked over to her, leaned over the wall to her and called her a disabled (abusive word). He then spat in her face,’ prosecutor Anthony Bailey said. Portsmouth Crown Court heard Smith falsely told police the woman called him a ‘homeless gay crackhead’. Smith, of Watersmeet, Fareham, denied common assault and using threatening words or behaviour but was convicted after a magistrates’ court trial. And Mr Bailey revealed a history of assaults involving Smith spitting at people and then claiming they had been homophobic. 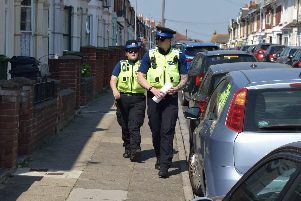 In 2017 he had drunkenly fallen asleep in the family home in Tukes Avenue, Gosport, and punched out at his dad who woke him, then punched his mother in the chest and spat in her face. Smith later racially abused the same man – but claimed to police the victim was homophobic. And in September 2017 he had been handed a suspended jail term after spitting at a doorman at Bar 38 in Gunwharf Quays, punching out and acting aggressively. Smith had been involved in a dispute with his boyfriend at the bar. Again, Smith claimed to police a doorman had ‘abused him’ over his sexual orientation. Daniel Reilly, mitigating, said Smith had delivered a card and chocolates to the woman apologising. Smith received eight months of the 14-month suspended term, and four months on top for the incident involving spitting at the disabled woman on March 30 last year.